KawaiiPunk - Kawaii Mascot Blog: Wow! It’s Waui Design! Pretty sweet, isn’t it? What you are looking at above are just some of the beautiful designs available from Waui Design. 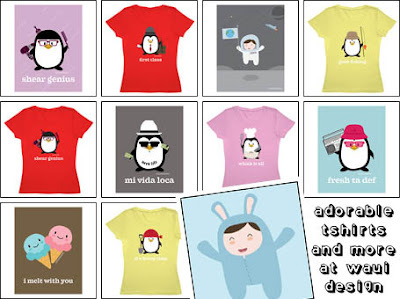 At the Waui Design shop you can buy t-shirts for the whole family, even babies, as well as stunningly cute stationery and prints! So I guess you really can say this is one shop that has something for everyone! And the best part is… it’s all utterly adorable! Yippee!